We wouldn’t blame you if you’re not 100% ready to jump into the Cloud, just because that’s what everyone else seems to be doing. Making the right decision for your business means taking a careful look at what exactly the benefits are going to be. How will your Oracle systems work in the Cloud? Can Cloud providers like AWS actually meet your requirements? How will deployment work? After all, it’s a substantial move and one that you’re unlikely to be peer pressured into. We’re big believers in breaking things down, and we like to show instead of tell when it comes to going cloud-based. If you’re an Oracle e-Business Suite user, then you’ll want to know that there won’t be any disruption to your business operations before migrating your systems to the Cloud. With the aim of conquering your remaining concerns, we’ve gone ahead and put together a framework for deploying e-Business Suite on AWS. The blueprint shows the architecture we use, plus we’ve given you a quick run-down of the practical ways that our solution can make your life easier. Whatever the nature of your business, it’s likely to be pretty important that users can access data whenever they need to. So, you’ll need an Oracle e-Business Suite solution with a highly available infrastructure. That’s what we’ve got for you here. Our solution uses multiple application tier servers across two availability zones – spreading your instances across locations means you’re less likely to experience a total systems-down situation as the result of one failure. 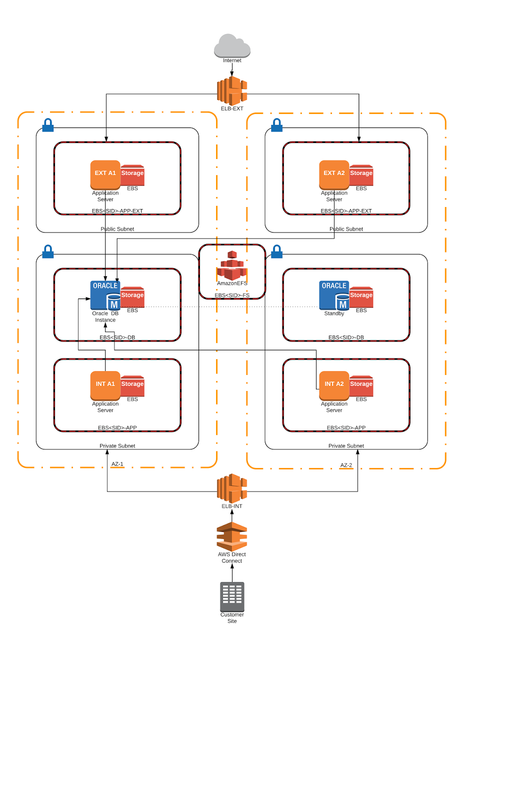 We also use a database tier with primary and standby Oracle on EC2 instances managed by our orchestration layer. The power of the cloud, harnessed for your convenience. Most business calendars will have at least a few periods when systems are under particular stress, and you’re going to be looking for a solution that means yours can cope with the extra work. Ours uses scalable components including Elastic Load Balancers, Elastic File Systems and Virtual Private Cloud. Plus, burstable resources such as Elastic Block Store and Elastic Cloud Compute Instances. This is the kind of flexibility that you’re looking for. You can stretch your systems to cope with ad-hoc demands and your essential business processes keep ticking along as usual even under pressure. If you’re going to the trouble of moving your Oracle e-Business Suite systems to the AWS Cloud, you’re going to be looking for a good reason to do it. Saving money is a pretty good one as far as we’re concerned. Instead of purchasing expensive hardware up front, you’ll pay a much more appealing, manageable monthly cost to use AWS. Highly automated services like Snapshots for backups and Elastic Block Store for storage driven by Lambda also mean a lower administrative overhead. Keeping your data and applications safe is going to be somewhere at the top of your list of priorities and AWS provides a rich tool set to keep you secure. Resources deployed in a Virtual Private Cloud are immediately protected from the outside world and access is controlled using Direct Connect and Security Groups. External application access is controlled using Elastic Load Balancers, Security Groups and strict routing between the public and private subnet. Your business stays safe and secure in the Cloud. Looking to take your next step in to the Cloud? We can help. Get in touch here.